Full house for petitions webinar! 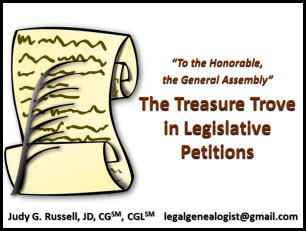 It’s going to be a full house tonight for The Legal Genealogist‘s Legacy Family Tree webinar, “To the Honorable, the General Assembly”: The Treasure Trove in Legislative Petitions. It seems that a lot of folks are interested in what genealogical gems may be hiding in the pages of petitions of both the federal and the state governments — and how to find them. And even after the free period, each recording is then available for purchase so you can review it more slowly, in more depth, at your own pace. Or you can just subscribe to the entire Legacy Family Tree webinar service, and get on-demand access to the entire archived set — some 410 classes of genealogical materials, 576-plus hours of instruction already and new materials added every week. The cost right now is $49.95 for a year, and $9.95 for a month. I know I often can’t sit in on webinars as they occur because of other commitments, but I’ve been able to take in terrific presentations anyway and they’re available for viewing now through the subscription service or by purchasing a digital download version: the Foundations in DNA series by Blaine T. Bettinger; or J. Mark Lowe on Researching Your North Carolina Ancestors; or John Philip Colletta on The Germanic French – Researching Alsatian and Lorrainian Families; or Yvette Hoitink on Researching Your Dutch Ancestors, just to name a few. I got lucky. My computer is on its death bed and sometimes just isn’t up to things, especially things that involve live downloads. Knew I could catch it on the web later (I am a member you betcha! ), but there is something about live and being there for the action… Surprized when somehow my computer started behaving at the last minute and I slid in! Whooey! Glad I did, because it was a terrific webinar. I’ve heard and read about petitions before but this one really got the concepts through my sometimes thick skull. When my new computer arrives (counting down), this webinar is at top of my list to review. Thanks, Judy!